October 01, 2018, 9:03 a.m.
With John McDonnell indicating on Monday that Labour would not support any second referendum that included a ‘Remain’ option, there was a revival of previous speculation that the Labour leadership has never actually been committed to the Brexit outcome that they backed at the EU referendum. Similarly, Tony Blair recently suggested in an interview that he believes that Theresa May does not think Brexit is a good idea. Now a new YouGov survey has asked the nation what they think various politicians would do on Brexit if they didn’t have to worry about what the public or their party would think or do about it. Half of Britons (48%) believe that Theresa May would keep Britain in the EU if she could. Both sides of the Brexit divide are of the same mind on this – 51% of Leave voters and 54% of Remain voters think the Prime Minister is personally inclined to Remain. By contrast, the country is much more convinced that May’s main Conservative competitor, Boris Johnson, is personally committed to bringing Britain out of the EU. Despite speculation that the former foreign secretary’s commitment to Brexit exists solely to further his career, 62% of Britons believe that Boris would have Britain leave the EU even if he didn’t have to worry about what the public or his party thought. Only 12% think he wants to keep Britain in the EU. While it has long been suggested that Jeremy Corbyn is secretly keen to see Britain leave the European Union, by almost two to one (43% to 22%) the public think the Labour leader’s personal desire is to see Britain stay a part of the EU rather than leave it. However, when it comes to what the public thinks is the preference of the majority of Labour MPs that ratio rises to almost six to one: 57% of Britons think most Labour MPs would keep Britain in the EU if they could, while just 10% think they want to carry out Brexit. 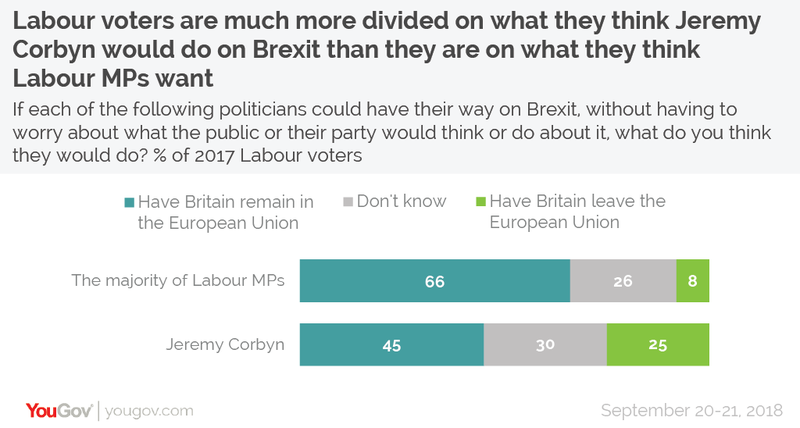 A similar difference in views is present among those who voted for the party in 2017 – while two thirds (66%) of Labour’s 2017 voters think most of the party’s MPs want Britain to stay in the EU, this falls to 45% for Corbyn himself. Finally, in a sorry sign for the Liberal Democrats, fully 45% of the public said they didn’t know what Vince Cable’s preference on Brexit would be (including 28% of Lib Dem voters).